These soft, textured cloths work gently without drying skin. They're dermatologist tested, hypoallergenic and safe for contact lens wearers. 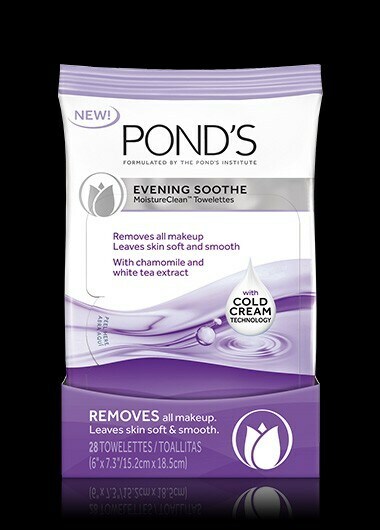 Infused with POND’S® Cold Cream technology, your skin will feel instantly soft. Now with a rigid lens closure, towelette dry-out is minimized. Keep a pack at home and one in your purse for on-the-go convenience! Wipe around the eyes, face, and neck to remove make-up and impurities. Tightly reseal after each use. For a soft finish, use with POND's dry skin cream. Evening Soothe® MoistureClean™ Towelettes is rated 4.4 out of 5 by 284. Rated 1 out of 5 by Breeze from Disappointed I have been using these for about 4 years. I agree with the older reviews, the prior wipes before the material change worked better. I still kept using them after because they kept the best moisture compared to other wipes. But, the last 3 packages I have purchased, the wipes were very dry. I just wear normal mascara and they weren't moist enough to take it all off, when they used to be able to. I also have to agree that the packaging does not keep them well either. I pefer the less use of plastic, but I keep mine either taped or in a ziplock bag to prevent them from drying out. After this third purchase, I am going to try another brand. I'm very disappointed. Rated 4 out of 5 by Betty from Towelettes are my favorite! Packaging is terrible. Ponds - wonderful product. The towelettes remove makeup well and are refreshing. However, the packaging has me looking elsewhere for a comparable product. The sticky "goop" is just impossible to remove completely. Any sticky "goop" residue left behind causes hair and whatever else to stick to the package. Gross. I threw the small 5 towelette package in my purse once. Big mistake. Everything stuck to it. Frustrating. Pleeease stop using the sticky "goop" to package the towelettes. I will purchase again when/if packaging changes. Thank you! Rated 2 out of 5 by Kara2267 from Breaks me out These towelettes cause me to break out, there is not enough texture to the cloth to really clean and these leave a sticky residue on my face that clogs my pores. I do however love the Luminous clean moisture towelettes in the pink box. Those are the only ones I use as they actually remove everything due to the nice texture of the cloth but is soft enough that it isn’t too rough on your skin. I like the smell of the evening soothe towelettes but the cloth texture is too soft and don’t leave me feeling as clean as the luminous clean towelettes in the pink package. The old towelettes were better. I won’t buy these or the ones in the blue package anymore. Rated 1 out of 5 by Matilda from Why would you change this? It was already perfect. Really upsetting that you've changed this product. It was 100% perfect: refreshing and effective at removing makeup. Now after just one try, this "new and improved" product leaves a discomforting feeling on my face and the scent is no longer a welcome, calming feature. You don't need to ruin a good product just to make sales. Now I'll have to go through the painful process of finding something else to use. Rated 1 out of 5 by Marcia18 from Please change wipes back I have used these wipes for years and they were the best, but with the new package the new cloths that are used are different and they do not work as well, it is like I can't get a grip on them to clean my face as well and one of the sides is just flat instead of the old cloths had texture PLEASE go back to using the old cloths!!!! Rated 5 out of 5 by Maynard333 from WOW! For a woman that never takes off her makeup.. I just usually take a shower to remove my makeup. I bought these on a whim at RIte AId. I have had this blackhead on my nose forever...and I have dry skin at age 52. It is almost GONE after 2 days of using it. My pores look amazing, and my pores and skin are sooo soft and the smell is great! It even took off my mascara without much rubbing. These are amazing, and my skin is so smooth. I am a lifer! My Mum used to use Ponds...they never fail to amaze me. Thanks so much! Get these...and they smell great! Rated 5 out of 5 by AhoyAiryn from Awesomesauce I got these in a thank you basket from a co-worker, otherwise I would have never tried them. I have never been the kind of girl who cared about her skin. It's somewhat oily, but it's not particularly bothersome. I always knew I should wash my face every night, but I almost never had the motivation to do so. I opened the package and the first thing I noticed was the amazing smell! They are heavily parfumed, which is refreshing, considering that most facial washes I've tried have no smell, or smell like a chemical bath. I'm also pleased with how easy they are to use. Keep in mind, I haven't worn makeup in months; however, I know cleansing is still important. I have picked up a good habit because of these. It's so easy to wash my face, that I don't mind doing it every morning and night. I've been using these for a few weeks now, and I've noticed my skin is much softer, my pores look smaller, and my face isn't as oily as it once was. Needless to say, I'm beyond pleased with this product.